Aladdin is a magical and musical romp that is sure to have you jumping out of your seats and singing in the aisles! People’s Light & Theatre presents Aladdin: A Musical Panto, co-written by Samantha Bellomo & Pete Pryor, with music and lyrics by Michael Ogborn. It runs November 14, 2012 through January 6, 2013 on the Main Stage. Associate Artistic Director Pete Pryor directs. When the young ne’er-do-well Aladdin and his animal pals discover a mysterious lamp, the hilarious adventure begins. Join the heroes as they rescue Princess Mai Tai, fly a magic carpet, and join forces with the beloved Dame, Widow Twankey, to save their village of Paolistein. Aladdin is a magical and musical romp that is sure to have you jumping out of your seats and singing in the aisles! Now in its 9th year, the holiday panto has become a tradition at People’s Light. When the modern panto became an established genre in the 18th Century, writers turned to well-known fairy tales and other favorite children’s stories to provide loose outlines for performances. Aladdin was one of the first stories adapted for a Panto performance and has remained an audience favorite today! The world premiere production of Aladdin: A Musical Panto reunites artists from past People’s Light panto productions with a number of newcomers. Pete Pryor and Samantha Bellomo return to direct and choreograph their fifth panto, but for the first time are the co-writers. People’s Light & Theatre is located at 39 Conestoga Road, Malvern, PA 19355. For tickets call 610.644.3500 or visit peopleslight.org. 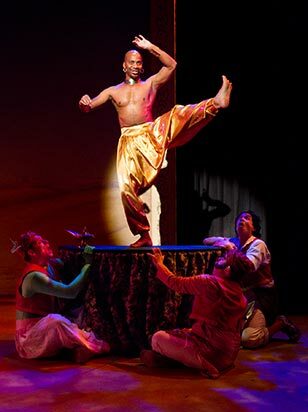 Aladdin is part of the PNC Arts Alive Discovery Series. Aladdin: A Musical Panto previews on Wednesday, November 14th, Thursday, November 15th and Friday, November 16th at 7:00 pm. The play opens on Saturday, November 17th at 7pm and runs through January 6th. Audiences are encouraged to join the artists after each Thursday evening performance for a conversation about the production. PNC Access half-price tickets are available for performances on Thursday, December 13th and January 3rd at 7pm. Single tickets start at $35. For tickets, call the Box Office at 610.644.3500. Special discounts are available for groups of 15 or more. For more information or to purchase group tickets, call 610.647.1900 x134, or email charles@peopleslight.org. At 12pm before select Sunday 2pm performance matinees of Aladdin, The Farmhouse Bistro will host a brunch featuring characters from the play. Brunch is $21.95 for adults and $12.95 for youth (12 and under). For reservations, call 610.647.8060 or visit TheFarmhouseBistro.com. « Giveaway: Pie Palooza 2012 with The Classic Diner!